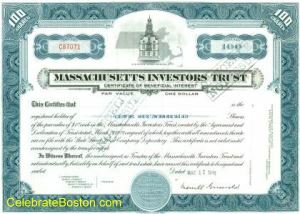 In 1924, Massachusetts Investors Trust began operating in Boston, the first mutual fund company in the United States. A mutual fund pools the savings of a large group of individual investors, and uses the capital to buy a basket of many different stocks. This allows a single investor to diversify their investment, and not buy just one or two stocks which is more risky. Another great benefit of a mutual fund is that it is managed by professionals in the industry. In 1926, Mass Investors Trust began publishing comprehensive reports to its investors, a benchmark procedure that all regulated mutual fund companies comply with today. The company was also one of the first investment companies to establish an in-house research department. "The Massachusetts Investors Trust, organized in 1924 to afford the investor an opportunity to purchase a broad list of sound common stocks in convenient units, has grown in the interim from $50,000 paid in to more than $2,500,000 and now numbers just short of 1000 shareholders. Its funds are invested in the common stocks of 136 leading American corporations. The trustees have acquired the holdings of common stocks for permanent investment, not for speculation. Their selection to date has show the following interesting results: Of the 136 stocks held, three have passed their dividends, paid extras, or stock dividends or issued results. The result of market fluctuations has been equally favorable. At today's market, 26 of the 136 stocks are selling at less than they cost, but the other 110 issues are selling for enough more so that the value of the trust shares is more than 10 points above t he offering price of 52-1/2." Mass Investors Trust was a real trailblazer in the financial services industry. Boston was a huge competitor to New York as a global financial capital, and still is today, due to innovation and integrity. L. Sherman Adams is credited with initiating Mass Investors Trust in 1924, which eventually evolved into MFS Investment Management and still thrives today.